According to feedback from the U. S. Preventive Services Task Force (USPSTF) it is scheduled to make a final recommendation on the PSA test screening issue during the first six months of 2012. 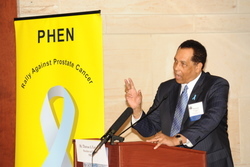 The USPSTF’s draft recommendation for a grade “D” level which it issued on October 7, 2011, if left standing, will dramatically change the fight against prostate cancer. The emphasis on early detection of the disease will be changed to an emphasis on not over-treating men. With an emphasis on early detection using the PSA test the overall prostate cancer mortality rate has declined by 40%. Is there scientific evidence to support a reversal in direction? For scientific evidence the USPSTF is relying heavily on the PLCO (Prostate, Lung, Colorectal and Ovarian) study which is the only randomized controlled trial in the United States for PSA screening. This study brings into question the benefits of PSA Screening, however, it is recognized by medical experts to be a severely flawed trial. Responding to recent revelations about the trial, members of the Prostate Cancer Roundtable sent a letter to Dr. Francis S. Collins, Director of the National Institutes of Health on January 24, 2012. The letter requests that NIH conduct a Quality review of the PSA screening data from the PLCO trial and to embargo its use until this review is completed; letter to Dr. Collins. Another important issue related to the PLCO trial is the lack of a statistically significant number of high risk men included in the trial (African Americans and men with a family history). In a letter dated January 23rd, 2012, from Dr. Carolyn Clancy, Director of the Agency for Healthcare Research and Quality, this issue was addressed with this statement; “I recognize your concern that the Task Force may lack sufficient scientific evidence on the effects of PSA testing on African American men and other high risk groups … I have urged the Task Force, as it finalizes its recommendation, to explain the evidence underpinning the applicability of their recommendations to men at higher risk of prostate cancer, such as African American men.” Dr. Clancy’s letter is in response to a letter from members of the Prostate Cancer Roundtable. Members of the U. S. Congressional Black Caucus, Representatives Donna Christensen (VI), Elijah Cummings (MD), Gregory Meeks (NY), Ed Towns (NY) sent letters to HHS Secretary Sebelius requesting that “the USPSTF, prior to the issuance of the final recommendation, provide the evidence and assumptions used to include men regardless of race and family history within its recommendation.” The request was that this evidence be made available in a public forum for comment. It is critical that the final USPSTF recommendation be THE RIGHT DECISION for all men, and the level of scientific evidence used to make a decision regarding high risk men should be no less stringent than that used for other men; a randomized controlled trial. As we approach the time where the USPSTF makes its final recommendation on PSA screening, the prostate cancer community will continue to weigh in and keep the public updated on this high priority public health issue. You are currently browsing the PHEN President's Corner Blog blog archives for February, 2012.